When a Japanese submarine surfaces on a summer night in 1942 to shell a gun battery on the Oregon coast, two young men embark on separate journeys. One will savor early victory, ecstatic love and the fiery destruction of his Japanese homeland. The other will lose his innocence in the ferocity of the Pacific War - well researched historical fiction. A team of brave Norwegian exiles, trained in Britain, infiltrated their homeland and awaited the opportunity to launch one of the most daring commando raids of the Second World War. CBI - China: Day 40 of 154 of the Japanese Invasion of Manchuria. Spain: Day 103 of 985 of the Spanish Civil War. CBI - China: Day 8 of 29 of the 1st Battle of Suiyuan. Spain: Day 468 of 985 of the Spanish Civil War. CBI - China: Day 113 of 2,987 of the 2nd Sino-Japanese War. Day 76 of 106 of the 2nd Battle of Shanghai. Day 57 of 70 of the Battle of Taiyuan. Spain: Day 833 of 985 of the Spanish Civil War. CBI - China: Day 478 of 2,987 of the 2nd Sino-Japanese War. Day 139 of 139 of the Battle of Wuhan. The battle ends in a Japanese victory. Day 16 of 81 of Japan's Operation GUANGDONG. CBI - China: Day 843 of 2,987 of the 2nd Sino-Japanese War. ETO - UK: Day 52 of 258 of the Blitz. ETO - UK: Day 110 of 114 of the Battle of Britain. East Africa: Day 140 of 537 of Italy's East African campaign in the lands south of Egypt. CBI - China: Day 1,209 of 2,987 of the 2nd Sino-Japanese War. Day 348 of 381 of the Battle of South Guangxi. CBI - Thailand: Day 27 of 221 of the Franco-Thai War (Vichy France vs Thailand). Russian Front - Finland: Day 121 of 142 of Operation SILVER FOX, a joint German-Finnish campaign to capture the Russian port of Murmansk in the Arctic. Russian Front - Finland: Day 119 of 140 of Operation ARCTIC FOX, a joint German-Finnish campaign against Soviet Northern Front defenses at Salla, Finland. Russian Front - Finland: Day 128 of 164 of the Battle of Hanko. The Soviets will be forced off their leased naval base. Russian Front: Day 128 of 167 of Germany's Operation BARBAROSSA. Russian Front - North: Day 50 of 872 of the Siege of Leningrad. Russian Front - Center: Day 26 of 98 of the Battle of Moscow. The Russians launch numerous counter-attacks around Moscow in an attempt to halt the German advance. MTO - Libya: Day 201 of 256 of the Siege of Tobruk. East Africa: Day 505 of 537 of Italy's East African campaign in the lands south of Egypt. CBI - China: Day 1,574 of 2,987 of the 2nd Sino-Japanese War. Germany: Seventeen-year old Helmuth Hubener is executed by guillotine, having been sentenced to death by the Volksgerichtshof (People's Court) for circulating over sixty anti-Nazi leaflets over six months in the Hamburg area. Helmuth Hubener was one of the youngest opponents of the Third Reich to be sentenced to death by the Volksgerichtshof, the dreaded People's Court. He was from a third-generation family of German Mormons in Hamburg and, since early childhood, a member of the Boy Scouts, an organization strongly supported by his church. But when scouting was banned from Germany in 1935, Helmuth joined the Hitler Youth, as required by the Third Reich. But after Kristallnacht (09 Nov 38), when the Nazis, including the Hitler Youth, destroyed Jewish businesses and homes, his eyes opened to the brutality that had become increasingly commonplace. When one of the leaders in Hubener's local congregation, a new convert of under two years, undertook to bar Jews from attending their religious services, Hubener began to find himself at odds with the rhetoric and actions of the few pro-Nazi Mormons in the Hamburg area. Local Mormons began debating the issue of how to best avoid trouble in this new Germany while remaining true to their core beliefs, but it had already degraded into something best conducted away from prying eyes and out of earshot. After completing Middle School in 1941, Hubener began an apprenticeship in administration at the Hamburg Social Authority, where he was later recruited into the resistance movement of another apprentice, Gerhard Duwer. Through this group he began listening to enemy radio broadcasts from the BBC, a treasonable act strictly forbidden in Nazi Germany. Then he discovered his brother Gerhard's shortwave radio in a hallway closet and began listening to the BBC on his own and used what he heard to compose various anti-fascist texts and anti-war leaflets, of which he also made many copies. Hubener's leaflets were designed to bring to people's attention how skewed official reports from Berlin about the war were, as well as to point out Hitler's criminal behavior, along with that of other leading Nazis. Other themes covered by Hubener's writings were the war's futility and Germany's looming defeat. He also mentioned the mistreatment sometimes meted out in the Hitler Youth. "German boys! Do you know the country without freedom, the country of terror and tyranny? Yes, you know it well, but are afraid to talk about it. They have intimidated you to such an extent that you don't dare talk for fear of reprisals. Yes you are right; it is Germany -- Hitler Germany! Through their unscrupulous terror tactics against young and old, men and women, they have succeeded in making you spineless puppets to do their bidding." 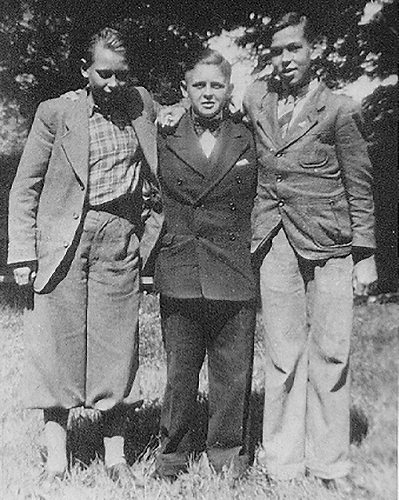 In late 1941, Helmuth Hubener managed to involve two friends in his listening: Karl-Heinz Schnibbe and Rudi Wobbe (shown in the photo above), who were fellow Latter-day Saints. Together they distributed about 60 different pamphlets, all containing typewritten material from the British broadcasts. They distributed them throughout Hamburg, using such methods as surreptitiously pinning them on bulletin boards, inserting them into letterboxes, and stuffing them into coat pockets. On 05 Feb 42, Helmuth Hubener was arrested by the Gestapo. He and his two friends and co-conspirators Schnibbe and Wobbe were tried by the Volksgerichtshof (People's Court) and on 11 Aug 42, were all found guilty and were sentenced, although only Helmuth received a death sentence. Schnibbe and Wobbe were given prison sentences of five and ten years respectively. "Now I must die, even though I have committed no crime. So now it's my turn, but your turn will come." Prosecutors during Hubener's trial made little mention of the trio's religious affiliation, except to state that the accused were members of the Church of Jesus Christ of Latter-day Saints. "I know that God lives and He will be the Just Judge in this matter. I look forward to seeing you in a better world!" Schnibbe and Wobbe spent three years together in a German labor camp, where they suffered beatings and starvation. Schnibbe was released early and drafted into the German Army just weeks before the war ended and was forced to march with the army to Russia. He was then taken prisoner by the Soviets and held as a POW in Russia for four more years. He did not return to Germany until 1949. Russian Front - North: Day 415 of 872 of the Siege of Leningrad. Russian Front - North: Day 176 of 658 of the Siege of the Kholm Pocket, USSR lays siege to the Kholm Pocket but the Germans hold out for a about a year and a half. Russian Front - South: Day 122 of 150 of Germany's CASE BLUE, the failed offensive to take the Caucasus oil fields. Russian Front - South: Day 66 of 165 of the Battle of Stalingrad, bloodiest battle in human history. MTO - Egypt: Day 5 of 20 of the 2nd Battle of El Alamein. The counter-attack by 21st Panzer-Division fails, costing them 50 tanks. MTO - Egypt: US B-25s and P-40s attack Germans who are holding back the Allied ground forces at El Alamein. US B-25s attack battle areas. East Africa: Day 176 of 186 of the Battle of Madagascar. CBI - China: Day 1,939 of 2,987 of the 2nd Sino-Japanese War. PTO - Alaska: Day 143 of 435 of the Battle of Kiska, Aleutian Islands. The US and Canada will defeat the Japanese invaders. PTO - Malaya: Day 251 of 357 of the Battle of Timor Island, a long guerrilla war ending in Japanese victory. PTO - New Guinea: Day 99 of 119 of the Battle of the Kokoda Track. The Australians continue pushing back the Japanese troops. PTO - Solomon Islands: Day 82 of 187 of the Battle of Guadalcanal. PTO - Solomon Islands: Day 3 of 3 of the Naval Battle of the Santa Cruz Islands. The battle ends in a draw, but the aircraft carrier USS HORNET is lost. USA: The Musicians Strike, begun 01 Aug 42 against the major American recording companies over disagreements over royalty payments, allows recordings made on V-Discs for distribution to the armed forces fighting in WWII. V-Disc ("V" for Victory) was a morale-boosting initiative involving the production of several series of recordings during the World War II era by special arrangement between the United States government and various private US record companies. 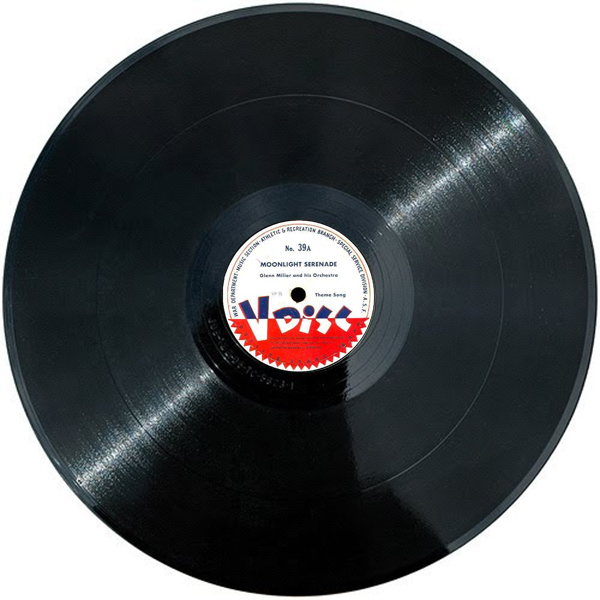 These 12-inch, vinyl 78 rpm gramophone recordings were created for the Army between October 1943 and May 1949. Navy discs were released between July 1944 and September 1945. Twelve inch discs were used because, when 136 grooves per inch were used, they could hold up to six and a half minutes of music. The V-Discs were an instant hit overseas. Soldiers who were tired of hearing the same old recordings were treated to new and special releases from the top bands of the day. And such a varied selection — big band hits, some swing music, classical performances from the top symphonies, a little jazz here and there, even some marching music. Many V-Discs contained spoken-word introductions by bandleaders and artists, wishing good luck and prayers for the soldiers overseas, and their hopes for a swift and safe return. Glenn Miller, for instance, introduced V-Disc 65A, issued in December, 1943, with the following message: "This is Captain Glenn Miller speaking for the Army Air Force's Training Command Orchestra and we hope that you soldiers of the Allied forces enjoy these V-Discs that we're making just for you." V-Discs also featured one-of-a-kind performances, as artists who were not shackled by restrictive record company contracts could now perform special versions of the 1940s' most popular hits. At the beginning of the Musicians' Strike, the record companies could release their new recordings to meet listeners' needs from their un-issued stockpiles, but eventually this supply was exhausted. The companies also re-released deleted records from their back catalogs, including some from as far back as the mid-1920s (the dawn of the electrical recording era). One re-release that was especially successful was Columbia's release of Harry James' "All or Nothing at All", recorded in August 1939 and released before James' new vocalist, Frank Sinatra, had made a name for himself. The original release carried the usual credit, "Vocal Refrain by Frank Sinatra" in tiny type. It sold about five thousand copies. When the record was released again in 1943 with Sinatra given top billing, and "Acc. Harry James and his Orchestra" in tiny type below, the record was on the best-selling list for 18 weeks and reached number 2 on June 2, 1943. A consequence of the Musicians' Strike was that a new musical style, known later as Bebop, developed by Charlie Parker and Dizzy Gillespie and others during the period of the strike, was not recorded and was not available to the general public and remained unknown and unheard for many years. 09 Jan 38: Nazi exhibit denounces "Degenerate Music"
02 Jan 41: Andrews Sisters record "Boogie Woogie Bugle Boy"
28 Jul 42: Spike Jones records iconic song "Der Fuehrer's Face"
Russian Front - North: Day 780 of 872 of the Siege of Leningrad. Russian Front - North: Day 541 of 658 of the Siege of the Kholm Pocket. USSR lays siege to the Kholm Pocket but the Germans hold out for a about a year and a half. Russian Front - South: Day 65 of 122 of the Battle of the Lower Dnieper River, USSR. MTO - Austria: US 12th Air Force B-17s and B-24s bomb Austria for the first time, hitting tactical railroads and bridges. CBI - China: Day 2,304 of 2,987 of the 2nd Sino-Japanese War. PTO - New Guinea: Day 39 of 219 of the Battle of Shaggy Ridge. PTO - New Guinea: Day 36 of 162 of the Battle of the Huon Peninsula. ETO - France: Day 88 of 284 of the Battle of Brittany. ETO - Belgium: Day 56 of 62 of the liberation of Belgium. ETO - Belgium: Day 26 of 38 of the Battle of the Scheldt Estuary. ETO - France: Day 43 of 236 of the Siege of Dunkirk. ETO - Germany: Day 39 of 145 of the Battle of Hürtgen Forest. Russian Front - Finland: Day 43 of 223 of the Lapland War. Finland and Russia have joined forces to kick the Germans out of Finland's most northern province. Russian Front - Finland: Day 21 of 23 of the Petsamo-Kirkenes Offensive. The Soviets will drive the Germans out of the Arctic region in northern Scandinavia. Russian Front - Center: Day 13 of 206 of the Battle of the Courland Pocket in Latvia. Germans will hold this area until the very end of the war. Russian Front - Center: Day 6 of 99 of the Siege of Memel, a border town of Lithuania and East Prussia. Russian Front - Center: Day 44 of 72 of the Battle into East Prussia and northern Poland. Russian Front - Center: Day 12 of 15 of the Battle of Goldap, East Prussia. Russian Front - South: Day 22 of 24 of the Battle of Debrecen, Hungary. Russian Front - South: Day 44 of 72 of the Battle of Belgrade, Yugoslavia. MTO - Italy: US 12th Air Force fighters hit communications and transportation targets. CBI - Burma: Day 210 of 302 of the Chinese Salween Offensive in Burma. CBI - China: Day 2,670 of 2,987 of the 2nd Sino-Japanese War. Day 194 of 259 of Japan's Operation ICHI-GO. PTO - New Guinea: Day 318 of 597 of the Battle of New Britain. PTO - New Guinea: Day 189 of 481 of the Battle of Western New Guinea. PTO - Palau Islands: Day 43 of 74 of the Battle of Peleliu (Operation STALEMATE II). PTO - Philippines: Day 8 of 299 of the 2nd Battle of the Philippines, aka the Liberation of the Philippines or the Philippines Campaign. PTO - Philippines: Day 8 of 73 of the Battle of Leyte. As an artillery spotter on the Eastern Front, Art Naujoks survived Stalingrad, and the horrors of being trapped behind enemy lines. As a Mormon, he was subject to ridicule and contempt from the German public. The troops deserved the best and got it delivered over the air waves! 72 tracks from dedicated V-disc sessions or American Government sponsored broadcasts await you on 4 CDs - nothing from commercial recordings. Reconstruction of the story of the largest single atrocity committed against American POWs on the Western front in World War II.